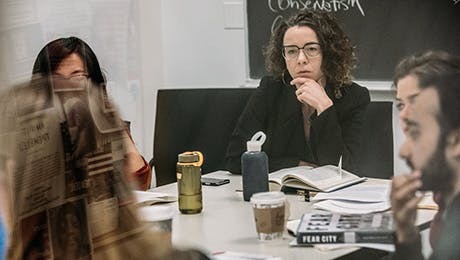 Grounded in theoretical foundations, The New School for Social Research gives students the opportunity to explore deep intellectual inquiry as they seek to understand and address today's most pressing social problems. Our distinctive intellectual tradition encourages public debate and rigorous academic pursuit. The small programs encourage close collaboration between students and professors. Working alongside faculty, students advance public debate, produce groundbreaking scholarship, and participate in lively discourse at our centers and institutes. Scholarly exploration and intellectual discussion at our leading centers and institutes. Students, faculty, and visiting scholars engage in interdisciplinary research, policy debates, and public discussion about the most pressing social issues of our time. Produce scholarship that inspires critical discourse and influences public discussion. Students and faculty can take part in The New School for Social Research's tradition of producing and disseminating rigorous work that engages with scholars from around the world. We offer distinguished students a selection of fellowships to support their academic study and intellectual inquiry. Fellowships are based on academic performance and financial need.